Tonight, three of Pádraig’s lecturers from TCD came to visit and they brought this with them for him to keep for the night and to be returned to TCD tomorrow. I had never seen this. I have never been in this room, Seomra na Gaeilge, that he had worked for so much – though I’ve seen signposts on TCD campus pointing towards it. How proud he was when this room was opened. How proud I am to see this big picture that hangs on the walls of that room he had pushed for so hard. Other things happened today. Nothing that would compare to this. 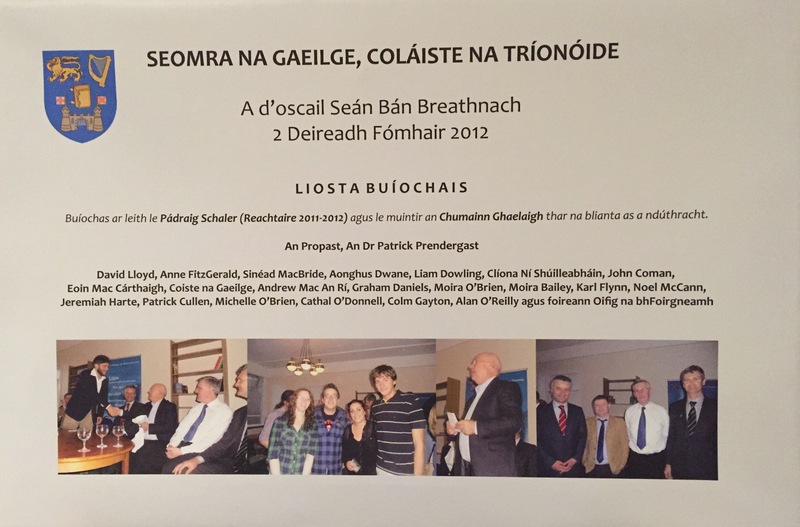 It’s a big picture that is usually hanging in the ‘Irish Room’, the Seomra na Gaeilge, in Trinity College. It basically says (my Irish ain’t great either:) thanks to Pádraig and all the people in the Chumainn Ghaelaigh, the Irish Society, of which Pádraig was Reachtaire (chairperson) 2011-2012, by the Provost (President) of Trinity College Dublin, Dr. Patrick Pendergast, on the occasion of the official opening of the room in TCD on 2 October 2012 by Seán Bán Breathnach, a very well known Irish (language) radio and television broadcaster and personality. – Pádraig was so proud that he managed to persuade TCD to have a special room in the College where Irish speakers could meet, chill out, talk, relax, have fun. For his lecturers to visit with the picture last night was one of those really moving, sad, proud, terrible, beautiful moments when time past launched back right into the presence. It was like a clash of two worlds when in reality it’s all the same, though sometimes it’s so hard to see that. It’s the circle of life, Ana.